Memorial Day is largely known as a holiday for travel and backyard barbecues with cold brews. Let's remember to keep those two things separate. AAA predicts that 39.3 million people will be traveling at least 50 miles away from home this Memorial Day weekend — starting today and running through Monday. That's a lot of potential traffic. Fortunately, PennDOT has a tool over at 511pa.com to help you find the best time to hit the road this weekend. Using data from the past two years, we've created a side-by-side map that shows the comparative speed on major interstates during one-hour intervals the Friday before Memorial Day or Memorial Day itself. So, (looking at the screenshot below) if you're in the Pittsburgh area the Friday before Memorial Day, you probably really want to avoid traveling between 4:00-5:00 P.M. 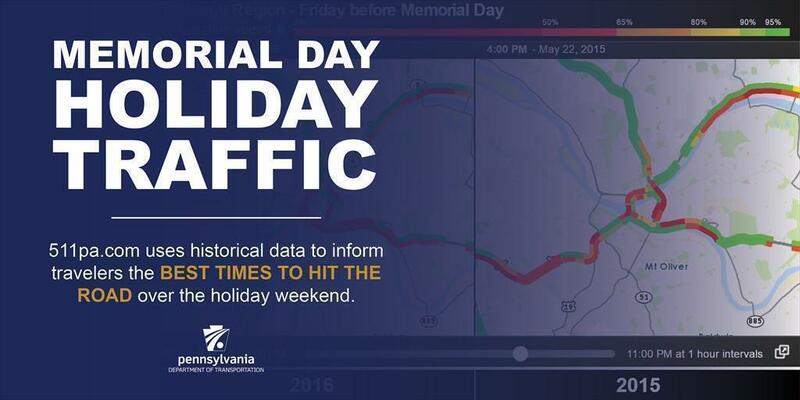 Combine this historical data with the real-time data offered 24/7 on 511pa.com and you can make educated decisions on when to begin your holiday travels. Historical data is available for the Altoona/Southern Alleghenies, Capital (Harrisburg/Lancaster/York), Greater Philadelphia, Lehigh Valley (Allentown/Bethlehem/Easton), Northwestern (Erie), Scranton/Wilkes-Barre/Poconos, Southwestern (Pittsburgh), and State College/Northern Tier regions. Motorists can check conditions on more than 40,000 roadway miles by visiting www.511pa.com. 511PA, which is free and available 24 hours a day, provides traffic delay warnings, weather forecasts, traffic speed information, and access to more than 770 traffic cameras. 511PA is also available through a smartphone application for iPhone and Android devices, by calling 5-1-1, or by following regional Twitter alerts accessible on the 511PA website. Now that you know when the best time to travel is, let's talk about the worst time — after you've been drinking. Impaired driving is no joke. Alcohol-related fatalities account for more than 30 percent of all traffic fatalities in Pennsylvania. And the cost of receiving a DUI can easily reach into the thousands of dollars. But more than the financial ramifications, there will be social consequences, like court appearances, community services requirements, or jail time leading to lost time and lost wages. Then there's the biggest cost of all — the potential of losing your own life or taking the life of someone else. One final reminder about the Memorial Day holiday: All driver license and photo centers will be closed Saturday, May 27, through Monday, May 29.